This vintage server would make a lovely gift for that special couple celebrating thir 50th anniversary. Lovely glass bowl sits on three toes and has cupped scalloped edges. Measures 7 1/4" in diameter. 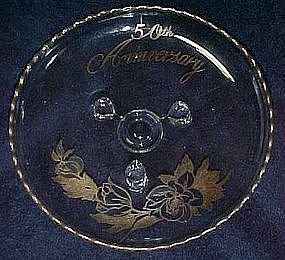 Decorated with a silver overlay of roses, and the words 50th Anniversary. Perfect condition with no damages. I'd fill it with 50 (Hershey) kisses, a kiss for every celebrated year. Any way you choose, it will make an impressive and memorable gift.